Thanks for joining the team today, we'll be back at 06:00 BST tomorrow with all your news, sport, travel and weather. The RNLI is urging people to "respect the water" this summer as part of a drowning prevention campaign. The charity says more people die in UK waters in August than any other month. Police are warning of a surge in crystal meth being found on the streets of Brighton and Hove. Officers say the drug is much more widely available than usual. It's looking bright for the bank holiday weekend. TV presenter Zoe Ball and her estranged husband DJ Norman Cook sat and "had a little cry in the car" while their son went to collect his GCSE results. The family celebrated outside Brighton College after Woody Cook got his grades. The teenager now wants to do A Levels in film studies and drama. Ball gave her son a hug and said: "I'm so proud of him." She revealed: "Norman and I just had a little cry in the car. We had to wait for ages and his dad's still waiting." The DJ - better known as Fatboy Slim - gave the teenager a hug and told him: "Well done. Done it, done it." And he then said to his son: "Thanks for coming straight back out, you know how I said come straight out, it's been half an hour now." The teenager said he achieved an eight in English Language and a seven in English Literature while also picking up a six in maths - higher than the four he had been expecting. Woody also received A grades in drama, DT (design technology), science and additional science and a B in computing. He said he was hoping to gain A* in some of these subjects and he would be requesting a re-mark. Missing: Have you seen Jack? Police say they're concerned for a man who went missing from St Leonards a fortnight ago. Michael Hutson, who prefers to be known as Jack, left the Woodlands Centre for Acute Care after going out for a cigarette break. He's on prescription medication for mental health problems, and police fear for his safety. A259 West Sussex eastbound severe accident, at B2233 Yapton Road. A259 West Sussex - A259 Grevatt's Lane in Climping, Littlehampton blocked, delays and stationary traffic eastbound at the B2233 Yapton Road junction, because of an accident involving two cars. Congestion to Bridge Road Roundabout and to the B2132 Yapton Road junction. Lawrence Schofield, is one of only 2,000 students in England to get 9s in English, English literature and maths, the top possible in the new system. "Very happy - but somewhat in shock," is the way the 16-year-old described himself after opening his results at his school in Horsham. He also achieved A*s in all his other subjects, which are still marked under the old system. "Staying positive and trying not to panic," are his tips for doing well. A convicted murderer, who launched a "horror film" hammer attack on police officers, could be back on the streets in two and a half years. Jamshid Piruz lashed out at two police constables with a claw hammer during a break-in on 7 January 2016 in Crawley. Earlier this year he was jailed for life, with a minimum of six years after admitting burglary, affray and two counts of attempting to cause GBH with intent. During an appeal hearing, the minimum tariff was reduced to three years. Footage of a fatal accident, shot by the motorcyclist who died, has been released by Sussex Police in a hard-hitting road safety message. More of the same tomorrow too. Thousands of you are collecting your GCSE results today from schools and colleges across Sussex. If you've been to get yours, send us your stories, pictures and videos. It started as a teenage house party. Now LeeFest is one of the South East's biggest music festivals. A teenager from St Leonards who suffers from a rare allergy to water has started her own YouTube channel to raise awareness of the condition. 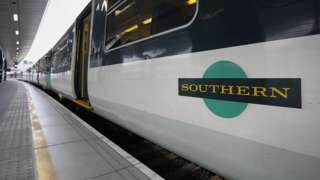 Southern and Gatwick Express passengers get automatic delay payments when they tap their smartcards. Danni Smith was raped, beaten, starved and imprisoned by his stepfather, who shared him with other paedophiles. He's won a five-figure payout from Brighton and Hove City Council, because social workers knew about the abuse for two years but left him to suffer in the house. Tributes are being paid to two Uckfield chefs who died after their car left the road and hit a tree.